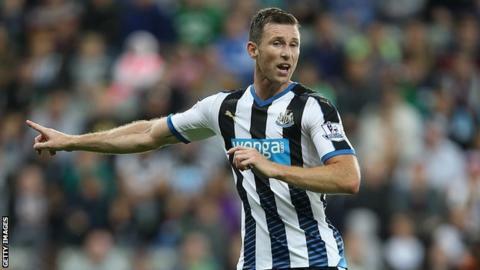 Wolves have signed centre-back Mike Williamson on a one-month loan deal from Premier League side Newcastle. The 31-year-old's arrival will ease the defensive concerns at Molineux, with head coach Kenny Jackett short of cover after losing Kortney Hause to injury. "As soon as I heard Wolves were interested, it was a no-brainer," Williamson told BBC WM. "It's a fantastic club and I've always admired them from afar - I'm just looking forward to getting started." Williamson has been with the Magpies since January 2010, and has made 150 league appearances. He has not played in the Premier League this season with his only action coming in Capital One Cup ties against Northampton Town in August and Sheffield Wednesday in late September. "It's a great opportunity for me to learn and experience a new culture and a new way of doing things," Williamson added. Williamson goes into the squad for Saturday's derby against Birmingham City as 14th-placed Wolves look to close the nine-point gap to the Championship play-off places.